Belgian Hares unsurprisingly originated in Belgian in the early 18th century. 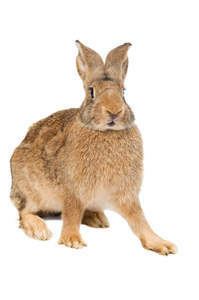 The breed was developed by crossing wild rabbits with domestic rabbits to create a practical meat rabbit. The Belgian hare made its way to England in 1874 where the breed was developed by a Mr Lumb to be more spirited and lively like the English wild rabbit. By 1887 the UK Belgian Hare speciality club was formed and the breed was growing in popularity particularly in America. In the 1920s the popularity of the breed dwindled. Many tried to breed this rabbit for meat even though physically it was unsuitable. This diluted the breed so it was rare to find a purebred Belgian, perhaps causing the lack of interest. The Belgian hare is a large rabbit that is slender with long legs. They are a rich chestnut colour with large bright hazel eyes. The Belgian Hare is an intelligent and energetic breed. They can be startled by noise and movement fairly easily due to their alertness and nervous disposition. This breed isn’t suitable for a novice rabbit owner or for children. The Belgian Hare is red/chestnut with hazel coloured eyes.